Wanxin Zhang was born in ChangChun, China, and spent his formative childhood years under Mao's regime during the 1960's and 1970's. 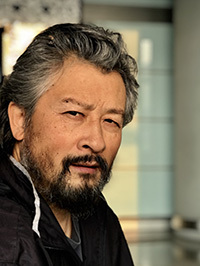 He was part of the first young generation to receive a formal art education in college after the Cultural Revolution ended in 1976, graduating in 1985 from the Sculpture program from the LuXun Academy of Fine Art. Zhang relocated to California in 1992. Zhang has received several grants and awards including the Joan Mitchell Painter and Sculptor Grant in 2004 and the Virginia A. Groot Foundation Grant in 2006. In 2010, the exhibition "Wanxin Zhang: A Ten Year Survey", curated by Peter Held, opened at Arizona State University Art Museum, and later travelled to Boise Art Museum (Idaho), Morean Arts Center (Florida), Bellevue Arts Museum (Washington), Holter Museum of Art (Montana), and Richmond Art Center (California). Zhang was the subject of a solo exhibition featured at the Fresno Art Museum in California in 2007 and the Alden B. Dow Museum of Science and Art in Michigan in 2008. Zhang exhibited in the 22nd UBC Sculpture Biennial in Japan in 2007, the Taipei Ceramics Biennial in Taiwan in 2008, and the Da Tong City 2nd International Sculpture Biennial in China in 2013. His work is included in the book "Confrontational Ceramics" by Judith Schwartz and has been reviewed in publications such as Art in America, Sculpture, and American Ceramics. In 2012, the San Francisco Chronicle picked Zhang's exhibition at the Richmond Art Center to be one of the Top 10 Exhibitions in the San Francisco Bay Area. In 2015, Zhang's work was included in a group exhibition, Character Studies: Clay from the Collection (2015) featuring work from the San Jose Museum of Art's permanent collection. He was also the subject of a solo exhibition, Clay Nation : Wanxin Zhang, at Peninsula Museum of Art, Burlingame, California.